Have You Integrated LinkedIn’s Recruiter System Connect? Every sourcer and recruiter suffer from shiny object syndrome. We all want what’s new, hot, fresh, and oh so shiny. We are quick to jump on the latest Chrome extension and sourcing tool. We are always in the hunt for more candidates, more Dean Da Costa, more budget, and need I say, more time. So often do we burst through the door after a successful meeting with our hiring manager, sprint through the hallway, and dive immediately into our cubicle to begin the quest to find new candidates. After we’ve left a trail of dust and chaos (or crumbs of nuts for all of you purple squirrel enthusiasts), we immediately open our sourcing weapon of choice (Google, LinkedIn, Hiretual, SeekOut, Amazing Hiring, Entelo, HiringSolved, you get the drift), and start mining the web for new talent. We spend hours combing through search results, scanning LinkedIn profiles, and scraping hundreds of web pages for contact information. The heat is on, and we are fueled by stale break room coffee and a labyrinth of secret passages and clues of purple squirrels and unicorns. The end of the hunt is near, and the sourcing chip on our shoulder has grown a few inches. We’ve mastered the intake, dominated the search and have crafted emails that would make Steve Levy and Brian Fink rewrite their SourceCon presentations to feature our brilliant messages. We did it, and now the wait begins. One by one, candidates return our messages. After a couple of email exchanges and a click of our automated email scheduler, we are on a roll. There is no doubt; our hiring manager will be impressed. I wish every search were like this. I’ve been that sourcer, always on the hunt. It’s human nature always to want something new. If you’ve seen me present at a conference, there is a good chance you’ve heard my reference to sourcing and dating. After a breakup, we don’t go back to the profiles that we’ve swiped left. But maybe we should? It took me two years to finally agree to go out on a date with my husband. We’ve been happily married for four years, and if you want to meet him, he is always hiding in the back row at SourceCon. As sourcers, some of us tend to overlook silver medalist candidates or any candidates that have lived in our ATS. Perhaps it was because these systems were so difficult to search for so many years, or maybe because we do indeed like to find something new. Nonetheless, I think we can all agree that our current network (referrals included) and applicant tracking systems are generally the first places that every sourcer needs to look before they begin their search. Outside of our ATS, LinkedIn is probably our second largest database of potential candidates (first-degree connections, not necessarily the second-degree connections) for any sourcer. I’ve spent the last decade building my LinkedIn database. It was a treasure trove of leads and connections for positions that I had open. Now, it’s an important membership list of our SourceCon community, filled with potential sourcing leaders, speakers, writers, and influencers. LinkedIn has undoubtedly become essential, and now and then, LinkedIn makes a move that impresses me. A few months ago, they made one and slowly but surely sourcers are taking advantage of it. Are you? This integration is a major time saver for any recruiter or sourcer. It’s a combination of the two systems that most recruiters use on a regular basis. Long gone are the days of toggling back and forth between the two systems you use the most. As you source candidates through LinkedIn Recruiter, your ATS will automatically become updated with candidate information and vice versa. After the integration, you will see a much more robust profile in LinkedIn Recruiter, complete with notes from your ATS, directly on a candidate’s profile. Additionally, it marks all of the candidates that your ATS has seen before when you are searching or filtering in LinkedIn Recruiter. Best of all, there is no catch. This is FREE. LinkedIn has integrated Recruiter System Connect into ten different applicant tracking systems. You also get to keep your data. If you change ATS partners or break up with LinkedIn, then you keep the data. The data is stored separately and remains in control of the customer at all times. Recruiter System Connect is only available to the lucky sourcers and recruiters who use LinkedIn Recruiter. If that is you, then I highly recommend you check with your LinkedIn representative to see if your company has fully integrated this serve. After all, it’s free! Recruiter System Connect is an initiative from LinkedIn to help better serve their customers to their ultimate goal of getting more hires. In the end, sometimes what is right in front of us is exactly what we needed. Take a look. With Recruiter System Connect, everything you need is in one time-saving workflow so you don’t have to switch between two platforms. Now your entire team can access candidates’ status and history in Recruiter. This helps ensure they don’t contact the same person more than once, providing a more positive candidate experience. 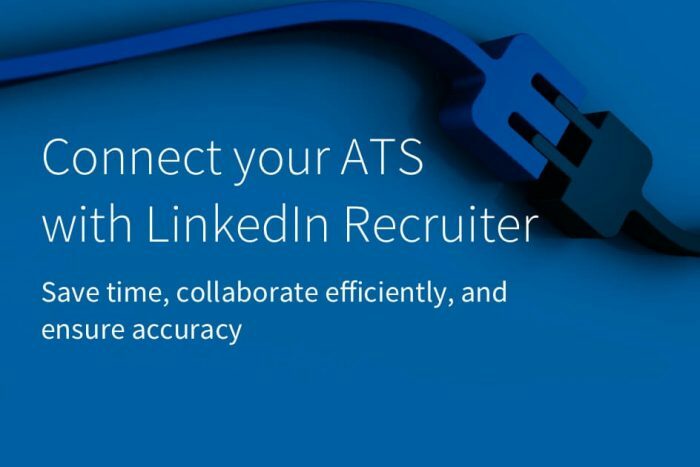 Recruiter System Connect allows you to see up-to-date LinkedIn profiles within your ATS. This prevents erroneous data and allows you to easily differentiate applicants with similar information.